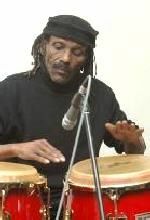 Percussionist, also credited as Bobby John or Bobby Johns. I don´t have too much data about him, so any info someone could provide would be very interesting. I have big gaps in his career, so I just include the data I have on him. I´m not sure of the period, but I guess it was still 1969. But Stignac didn't stay too much in the band. I have live footage of the band at the Bilzen Festival in 1969, and I see two black percussionists in the band. Can someone tell me who could he be, apart from Bobby Stignac? I´m not sure of the lineup appearing here, can someone confirm me that, please? Oh, this is hard to track! Gonzalez was a British band, formed around 1971, whose members weren't a stable lineup. The lineup could include from 10 up to 30 musicians. Bobby Stignac was their main percussionist after the first couple of years, and became a constant member. They released their first, self-titled Gonzalez album in 1974, with this lineup. Finally there's some Gonzalez album released on CD. There's a 2in1 CD containing the 1st and the 2nd albums (that is, Gonzalez (1974) and Our only weapon is our music (1975)). It's a release from June 1998 in the label See For Miles. For some reason, it seems that Haven't stopped dancin', released in 1979, is a reissue of Shipwrecked (released in 1977). Their last album was Watch your step, but I don't know the lineup, as I don't have it. Help, please! Without any human form to include here all their members, they continued playing together, in their own albums as Gonzalez, as well as in many other albums by different artists, until 1986, when founder member Roy Davies died. Many of the members kept on playing together in a new band, Cayenne. 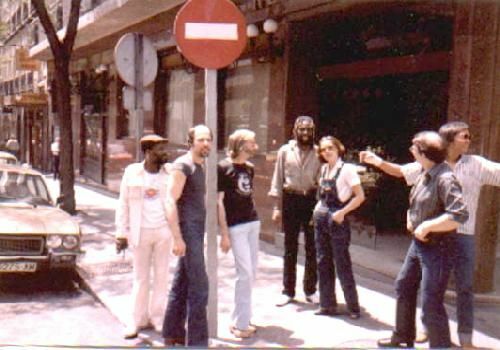 Robert Ahwai, Louise Arthurworrey, Richard Bailey, Bud Beadle, Tim Cansfield, Ron Carthy, George Chandler, Phil Chen, Gerry Conway, Roy Davies, Winston Delandro, Carl Douglas, Martin Drover, Mick Eve, Steve Ferrone, Rosko Gee, John Giblin, Steve Gregory, Malcolm Griffiths, Kuma Harada, DeLisle Harper, Preston Heyman, Randy Hope-Taylor, Janice Hoyte, Colin Jacas,... up to 42 musicians. + other members unknown to me. Help! The Engine Room Collective is a band formed by drummer Matthew Phillip, and they are specialists at backing pan steel players. THE ENGINE ROOM COLLECTIVE #? RED HOT SUNDAY BAND #? + others members and vocalists, unknown to me. Help! I wish I was there to attend these gigs! Comments: There was a vinyl reissue in year 2000 from the label Soul Brother that deleted some tracks from the original album and added 3 tracks taken from Our only weapon is our music. Comments: This was a new album by Gonzalez that appeared around 2001 (I´m not sure of the date, as I haven´t the album). 10 new tracks, plus 3 old tracks. Chris Mercer: for valuable info on Bobby (2010). Ged Peck: for info on Marsha Hunt lineups (2003). Ray King: for info on Bobby with Diablo and Paz (2012). Hanspeter Kuenzler: for info on Bobby with Red Hot Sunday Band (2013). 17/July/2013 - Added info about Red Hot Sunday Band. Thanks to Hanspeter Kuenzler. 08/October/2010 - Page added to the blog. Bobby stignac is my father i be happy to give u more infomation do you have an e-mail address?? My name is Ray King, during the mid seventies, whilst your father was with Gonzalez, he also gigged with various other bands, including Paz at many of the W.London pubs on the circuit, and with Diablo (a latin rock band) with whom I was the drummer, and my father Don King, was on timbales. Our regular conga player was Bobby de Montez. Diane Stewart ex Airforce, who was Graham Bonds wife was also a member at one point. I have a good photo of him from the period after a gig in Kent with all six members of Diablo. Thanks for your message. I'm the webmaster of this site, and I'd love if you could send me a copy of this photo, please. I'd also like to ask you for info about the additional members of Diablo. Please, write me at molympus1@gmail.com. If you want, you can see some photos of Diane Stewart in my page about Aliki Ashman (the photos are from 1970, when they sang together in Airforce). Thanks for writing! Could you give me more info, please? Is the band the Red Hot Sunday Band or a different band? Can you write me to molympus1@gmail.com with info about the other players, please? Mick Eve, what a great legend to me! He's already featured in my pages about his mates Chris Mercer or Speedy Acquaye.